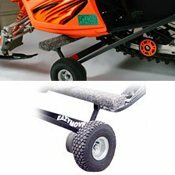 For your Eazymove Snowmobile Cart: Optional 10" pair of pneumatic wheels for outdoor use. These "big wheels" work great in dirt, grass, sand, gravel and snow. Made in the USA.